I know it feels like it’s too soon for Valentine’s Day, but I just couldn’t wait to share this pretty Valentine’s Day Wreath with you! I love Valentine’s Day decor… which is weird because I don’t really celebrate the holiday. I think it’s all the pinks, reds, hearts, and flowers. It’s all so girly and pretty! A crochet along is a project that’s broken into parts with a specified starting date so we can all work on a project at the same time together! This crochet along will have three parts. 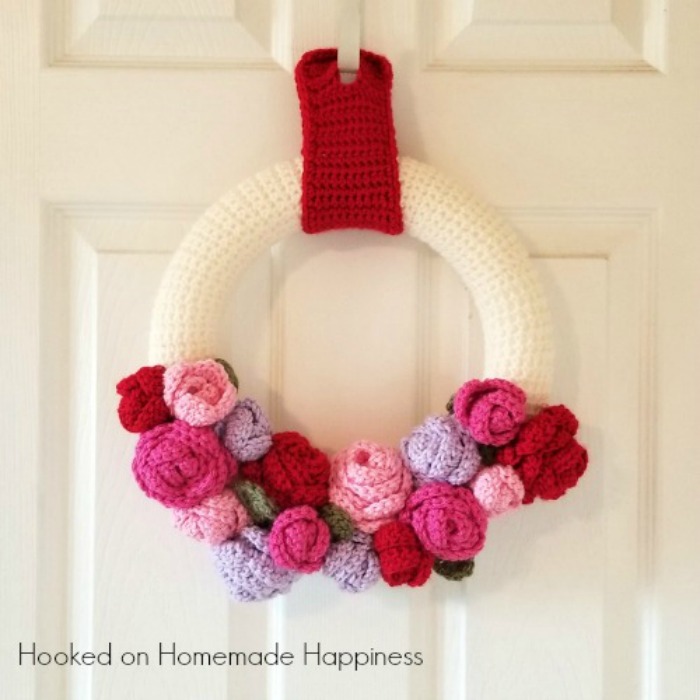 The first part will be crocheting the wreath base, part 2 will be the roses and leaves, and part 3 will be putting all the pieces together and adding the hanger. Part 1 of this crochet along will be posted on Monday, January 8th. It will last 3 weeks and we should be done just before February. Just in time to hang up your wreath for Valentine’s Day! I’ll also have the entire pattern ready as a PDF available if you’d rather have the whole pattern at once. I’ll see you here on Monday, January 8th for part 1!